In this paper, we propose a system that consists of a simple fusion of two methods of the aforementioned types: a deep learning approach where log-scaled mel-spectrograms are input to a convolutional neural network, and a feature engineering approach, where a collection of hand-crafted features is input to a gradient boosting machine. 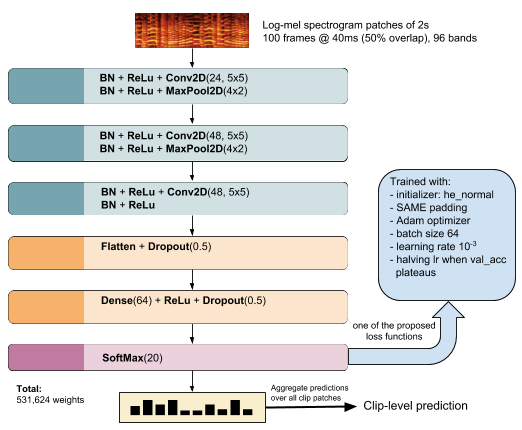 We investigate supervised learning strategies that improve the training of neural network audio classifiers on small annotated collections. A general problem in acoustic scene classification task is the mismatched conditions between training and testing data, which significantly reduces the performance of the developed methods on classification accuracy. In this paper, we propose a new strategy for acoustic scene classification (ASC) , namely recognizing acoustic scenes through identifying distinct sound events.